There is a slowly growing trend in the beauty world. Many skin care product developers are beginning to see a growing desire among consumers who want more all natural products. There are so many products–backed by big marketing budgets–that claim to be the best for any skin type. However, many of them are loaded with all sorts of artificial ingredients and chemicals. For consumers who want an all natural product, there is one tried and true product scientifically proven to yield terrific results. Its essential oils are used in everything from medicines to dietary supplements. The oil is also used in numerous skin care products including creams, lotions, soaps, and so on. It is coconut oil. One of the best forms of coconut oil is unrefined virgin coconut oil. This all natural, unrefined product is the best because it is not stripped of any of its original components–including its skin nourishing antioxidants. When refined the structure of the coconut oil is broken down and many vital components can be stripped away. 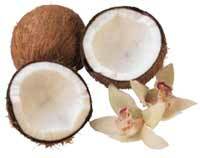 The essential oils in coconuts are well-known for soothing and improving skin problems like psoriasis and eczema. Unrefined virgin coconut oil is a rich product that has an abundant amount of free-radical fighting antioxidants and disease preventing antiseptic fatty acids. Coconut oil also has a naturally small molecular structure which means that it easily absorbs into the skin. The fatty acids in coconut oil also help protect skin from bacteria and fungi that cause infections like athlete’s foot, acne, warts, and more. Its most compelling benefit is its anti-aging properties. It is full of antioxidants which go to battle with free-radicals. Free-radicals slowly destroy skin and ultimately cause wrinkles, sagging, liver spots, and other signs of aging. The skin is composed of a number of connective tissues that free-radicals attack over time, and coconut oil greatly slows down the aging of skin by preventing free-radicals from forming. Great post. Thanks for sharing the benefits of virgin coconut oil for your skin care. Its qualities are really unmatchable.